Several months after my Twitterdoorbell adventures I decided it was time for a new (not so) useful Arduino project. After I bought 5 meters of RGB LED strip ("IClite Digital RGB-LED Flex Band") at the Aldi in Germany and successfully connected this to an Arduino Uno, I knew it's destiny was to hang in my christmas tree in December to act as Twitter controlled christmas lights. To change the color of the LED strip, a twitter user has to send a tweet with hashtag #twitmaslights, followed by a colon (:) and a six digit hexadecimal number (red-green-blue). For example: #twitmaslights:ff0000 would make the LEDs turn red. Because the Aldi LED strip doesn't work with the AdaFruit Neopixel library out of the box, I needed to use this modified library. The Aldi LED strip comes with a 12V power supply which connects to a controller. This is a little white box which has 4 outputs: V (VCC), G (ground), another G (ground) and D (data), which all connect to the four corresponding inputs (called VCC, GND, GND and DI) on the LED strip. The DI connection on the LED strip goes to pin 6 on the Arduino. The GND connection next to DI on the LED strip goes to GND on the Arduino. Because the Arduino Uno can only supply 5V, you have to leave the VCC and the GND next to it connected to the original controller. To test the LED strip, just use the "Strandtest" example that comes with the Neopixel library. Using the Twitter API to search for specific tweets used to be a simple matter of an http GET request which you could paste in the url field of your browser. But nowadays you must use 0auth to connect to the API and use something called Apllication-only authentication. The drawback of this method is that you have to connect to the Twitter servers through SSL. Unfortunately, an Arduino Uno is too slow and does not have enough resources to be capable of this task. I came up with the following solution: I created a PHP script on my own web server which makes the request to search for a specific tweet. Then the PHP script parses the JSON response from Twitter and outputs the search result on a web page: twitmaslights.crutzen.eu. The only thing the Arduino does is connecting to this page and read the output: the tweet which was searched for. This script outputs the most recent tweet with hashtag #twitmaslights betweet <tweet> tags and the user who sent the tweet between <user> tags. It uses the TwitterApiExchange class, which you can find here. Now it's the Arduino's task to connect to twitmaslights.crutzen.eu, look for the text between the <tweet> and <user> tags, filter the hex color code from the tweet and change the color of the LED lights accordingly. 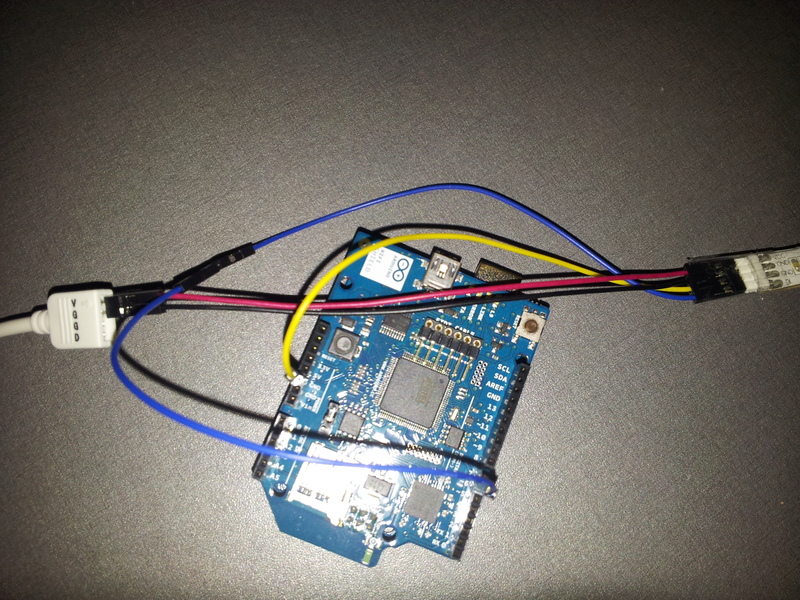 As mentioned before, I use an Arduino Uno with a WiFi shield. I had issues connecting to a server with version 1.0.5 of the Arduino IDE. But using IDE 1.0.3 instead solved this problem. I'm going to explain the sketch piece by piece. If you want to download the sketch as a whole, you can do this here. Control an Adafruit NeoPixel strip via Twitter. First, we include the necessary libraries. TextFinder is used to search for a specific string in a stream. You can download it here. The AdaFruit NeoPixel library can be found here. If you, just like me, use the German Aldi LED strips, you have to use this library. Put the downloaded folders in the sketchbook/libraries folder. The last line is the declaration of the strip object. The first parameter of the constructor is the number of LEDs in the strip. (Because I messed up my own strip a little, I had to cut out a piece and now I only have 49 lights left.) The second parameter is the pin number (6) to which the strip's DI input is connected to. These variable declarations are used to make a connection with the WiFi shield. I copied the most of the code that handles the WiFi part from the WifiWebClient example on the official Arduino website. I think that most of the above variables are self-explanatory. oldTweet is used to check if the detected tweet is a new one. The setup() routine initializes the LED strip, the serial window (used for some debugging info) and connects to the Wifi network. The WiFi part is from the WifiWebClient example again. The printWifiStatus function puts some info about the connection in the serial window. The loop() routine starts with connecting to the webserver and then makes a http request for index.php: the file that returns the tweet and user. After that comes one the fun parts: look for text between <tweet> and <user> tags. If found, check if the tweet is not the same as the previous one (oldTweet). If it's a new tweet, call the function foundTweet, which handles the color code parsing. This function is used by the setup() routine to give you some info about the established WiFi connection. Again, this code is from WifiWebClient example. The foundTweet() function is my favorite part of the sketch! It checks for the hashtag #twitmaslights, followed by a colon (:) and six hexadecimal digits. These digits are then stored in a character array and each of the three pairs (which represent red, green and blue) are converted to a numeric values with the hexToByte() function - see below. These numeric values are used as parameters in the strip.SetPixelColor() function, which turns the lights on. Not everyone knows what hexadecimal numbers and html color codes are, so I could also make the Arduino search for #twitmaslights followed by the official names of some of the most used html colors. By polling my server only once in 30 seconds and only using the color in the most recent tweet, it could happen that some tweets don't get handled. Polling Twitter more often than once in 30 seconds could result in a ban. So I have to change the sketch so that every tweet is put in a queue. But because I don't expect that my Twitmaslights will be that popular, this doesn't really have a high priority. How cool would it be to connect a photo camera to the Arduino and tweet a picture of the lights back to the person who requested a new color? The Arduino Uno can't handle processing the camera image, so I ordered an Arduino Yún. I expect the final result with the camera to be really cool, so stay tuned to my blog and twitter account if you want to know how I'm going to make that work! I have tried your code on a similar arduino/twitter project but your initial PHP code is giving me an error of "Notice: Undefined offset: 0 in index.php at line 24" and "Notice: Undefined offset: 0 in index.php at line 26". I hope that you understand my question and are able to help. I loom forward to hear from you. In the article, I forgot to explain what line 3 in the php file does. It includes the file TwitterApiExchange.php file, which you can find on https://github.com/J7mbo/twitter-api-php, along with detailed instructions about how to use it.